What is Innova Health Lucuma? Lucuma is a type of fruit native to Peru. Long used as a sweetener and a flavouring agent for foods such as ice cream, lucuma is also said to offer a variety of health benefits. Lucuma powder is made from the subtropical fruit of the Pouteria lucuma tree, which is native to Peru, Chile and Ecuador. Known as the Gold of the Incas in ancestral times, the fruit is yellowish green and egg-shaped with a dry, starchy yellow-orange flesh. The taste is described as maple or caramel to pumpkin-like. It is a ‘Super Food’ and it looks like an avocado. Peruvian culture is steeped in traditions rich in fine foods and cultural culinary delights. The Lucuma name has been honoured both spiritually and culinary since ancient times. Today, this fruit is still prominent in contemporary Peruvian celebrations. The pulp of the lucuma fruit is dehydrated to produce the lucuma powder, or flour, which is marketed primarily as flavouring. Lucuma is gluten-free and a source of antioxidants, fiber, carbohydrates, vitamins and minerals necessary for bodily functions and of benefit to the immune system. Using lucuma powder is an excellent way to get a boost of rich antioxidants and B vitamins. Lucuma provides 14 essential trace elements, including a considerable amount of potassium, sodium, calcium, magnesium and phosphorus, while heavy metal content is low. Lucuma powder contains 329 calories per 100 grs, 87 grs of carbohydrates, 2.3 grs of fiber, 4 grs of protein and 2.4 grs of total fat content, 92 mg of calcium and 186 grs of Phosphorus. 1 tablespoon of lucuma provides 2 percent of the recommended daily value for iron, which may help stimulate the immune system and improve physical endurance. Lucuma is often touted as a rich source of nutrients including beta-carotene, vitamin B3, iron, zinc, calcium, magnesium, and other vitamins and minerals. It also contains protein, antioxidants, and dietary fiber. Consumption of Lucuma fruit may aid in the management of diabetes and high blood pressure. This all-natural sweetening powder can not only help stabilize blood sugar, but also curb cravings and appetite. The fruit has long been said to aid in fertility, as it has been a Peruvian symbol of fertility for several millennia. This means that just a little of this powder used as a sweetener will go a very long way. 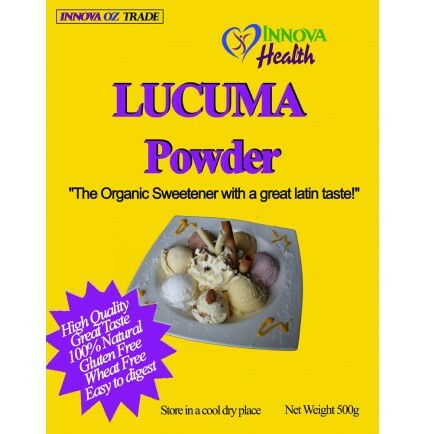 Lucuma powder is a safe sweetening alternative to sugar for diabetics. Because of the rich antioxidant content of lucuma powder, this all natural organic sweetener has immune system boosting potential, as well as the ability to fight and prevent certain diseases and illnesses including cancer. Lucuma supports as well in healing and speed up wound closure, making it a powerful natural healer. Also showing natural antibiotic, antimicrobial, and antifungal properties, the flesh of the lucuma fruit is a common source of natural healing and medicines among the native South American people where the fruit grows. Lucuma is gluten-free and a source of antioxidants, fibre, carbohydrates, vitamins and minerals necessary for bodily functions and of benefit to the immune system. Lucuma is said to reduce inflammation, boost the immune system, lower blood pressure, and protect against some forms of cancer. Lucuma is also touted as a low-glycemic alternative to sugar for people with diabetes. Proponents claim that unlike cane sugar, lucuma is low in sugar and does not lead to the same increase in blood sugar levels. As a sugar substitute, whole lucuma fruit is typically dried at a low temperature and then ground into powder. In addition, oils extracted from the lucuma nut are said to promote wound healing and help treat skin disorders when applied directly to the skin. Remove from freezer about 20 minutes before serving. Make sure all ingredients are room temperature. Stir together all but the coconut butter and oil together, then add them and stir in to incorporate. Press the mixture into the bottom of a plastic wrap lined container (container size will determine how thick or thin the fudge will be). Chill in the fridge for at least 4 hours. Slice. Blend all but the psyllium, oil, and butter until smooth. Add other ingredients and blend all together. Pour the mixture over the crusts. Chill in the fridge or freezer until firm (at least 8 hours in the fridge). Grind the almonds to flour in a food processor. Add the pitted dates and process into a dough. Add 1 teaspoon water if needed to hold the mixture together. Mix the yolks of 2 eggs with 2 cups of fresh milk and sugar. Place them in a pot and simmer in low heat, whisking until turns creamy. Dilute 1 teaspoon of cornstarch or Konjac in 1 cup of water and add to the cream and continue cooking. Separately, beat the milk with the 2 egg whites and add to mixture. Blend ½ cup of lucuma flour with remaining ½ cup milk and pass through a strainer. Add it to the above cream and cook a few more minutes. Remove from heat, cool and place in suitable containers with lid in the freezer. Process 5 frozen bananas in a powerful blender. When it turns to ice-cream consistency, add 2 tablespoons of lucuma powder to produce a lovely butterscotch flavoured ice cream that is full of health benefits for your family! Also it can be used with smoothies, nut milks, raw or cooked cakes and cookies to give a wonderful rich flavour. It goes really well with nuts of any variety and with bananas. The most popular ice cream flavour in Peru is Lucuma. In Peru where lucuma is abundantly available, this fruit is often the first solid food for infants. Just like bananas and sweet potatoes, lucuma is soft, sweet, and extremely easy to digest. As well as trace minerals and vitamins make it is an excellent source of nutrition for not just babies, but people of all ages. The sweet, maple flavor is a rapidly growing favourite flavour of ice cream, and with the added vitamins, protein, and zinc, it is perhaps the healthiest choice for flavouring and sweetening a variety of different dishes.